This flag seems to be traditionally used in the region (middle age?). The flag of the anciant republic was red with SPQR in it. Later, in the Christian era the cross was added. SPQR is the acronym of 'Senatus PopulusQue Romae', i.e. 'the Senate and People of Roma'. This was a kind of 'motto' of the Ancient Roman Republic, which was applied on state monuments in Roma. SPQR seems to have been used also in the Roman vexilla, at least in the vexillum shown on the first page of Asterix albums (and in the first image of the first album of the series, Asterix le Gaulois). I'd like to make a remark about the traditional flags of the city of Rome: the colours shouldn't be brilliant red and yellow, but - in a more correct way - dark red (bordeaux like) and gold. The first one is the symbol of the emperor, and gold for sovereignty. This is perhaps quibbling, but SPQR actually stands for "Senatus Populusque Romanus", "The Senate and People of Rome" (literally the Roman Senate and People). The expression is clearly written out in a number of inscriptions, so there is no guesswork involved. I suppose one could say that it was a kind of "motto", but I think that it is more accurate to say that this was the official monogram of the Roman Republic. From what I have been able to gather, official documents of the Senate were placed under a seal that read "SPQR". The SPQR represented the Roman Republic in the same way that "US" or "USA" represents the United States, or the way that "UN" (or "NU", if you speak French) is used as an identifying mark on the helmets and vehicles of United Nations peacekeepers. Roman armies carried standards with the SPQR monogram, and it was used in official inscriptions and official documents. The modern city of Rome has revived it for use, *inter alia*, on manhold covers and curbside trash cans, to indicate two places where I saw it used. Interestingly when I was in Benevento, I saw "SPQB" on the manhold covers there -- which can only stand for "Senatus Populusque Beneventanus", the Senate and People of Benevento. Since there never was any such thing, I could only guess that this was an attempt to poke fun at the modern Romans' revival of the SPQR monogram. It is said that modern Italians like to say that SPQR actually stands for "Sono pazzi questi romani", "Those Romans are crazy." I wouldn't be sure that the use of SPQB by Benevento is simply intended as a parody of Rome. SPQ* has been widely used all over Europe and beyond, from Liverpool and London to Olomouc in the Czech Republic and Vienna (Senatus Populusque Viennensis), to Florianopolis, Santa Catarina, Brazil (SPQ Florianopolitanus) as an assertion of municipal pride and civic rights. I remember very well seeing SPQF (SPQ Florentinus) in Florence, but the fact that many municipalities using the initials were never independent city-states seems to be no obstacle. SPQR has been used on several modern reconstructions of Roman flags and vexilloids, see for instance the eagle (aquila) standard on the page of the re-enactment group "Legio XXIV" (<www.legionxxiv.org>). However, as far as it is known, the SPQR, though used widely in inscriptions, was never used on any kind of flags in antiquity. The main reason would be: These flags were basically military standards for the respective military units, and not *national* flags. As the soldier all belonged to the Roman army, which was in essence marked by the whole system of flags, they didn't need a reminder. These flags (vexilla as well as signa of different units) contained other inscriptions, though; in most cases these would be short forms of the name of the unit, for instance "LEG II AUG" for "Legio II Augusta", a legion stationed in Britain. A vexillum with this inscription can be seen on the "Bridgeness distance slab" from the time of emperor Antoninus Pius (138-161 AD). See also Roman Empire - Historical Flags. It is my understanding that the bases of the eagle standards for the legion itself (after the reforms of Marius which did away with other legion symbols) had the letters "SPQR" on them, like the regimental number for Napoleon's regiments did. I had not heard of the letters being on vexilla of the legion - just the eagle standard itself. Is this flag supposed to represent the City of Rome sometime during the era of pontifical rule; the city and surrounding district during that time; or the entire Papal States? Roma republic was created 7 March 1798. The flag, took from the french flag, was granted by Napoleon. It was in use until the supress of the republic on 29 September 1799. The flag was Vertical black, white, red. Znamierowski [zna00] shows (p. 118) the flag used by the Roman Republic between 1798 and 1799. We have the flag described as a vertical tricolor black-white-red. 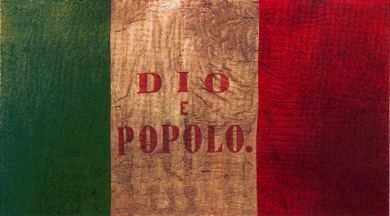 Roberto Breschi, in his presantation: "Flags in Italy under Napoleon's pressure" at ICV 20 in Stockholm, gave February 1798 as the date of adoption. Roma Ensign from XIX century plates. In 1849 a Roman Republic was proclaimed. Photo of different flag at <www.tricolore.it>. Same different flag appears at Wikipedia. The 29th flag mentioned and illustrated in the Book of All Kingdoms [e9s50] is attributed to Rome. This as depicted in the 2005 spanish illustrated transcription [e9s05], a red flag with a thin yellow horizontal stripe and black letters reading "Spqb" (sic!) on it but slightly overflowing; flag shown in the ogival default shape of this source. The anonymous author of [e9s50] describes the flag thusly: "Las se�ales de Roma son un pend�n bermejo con una vanda de oro en que son letras desta manera (The sign of Rome is a red pendon with a golden bar on which are letters like this). Neither this exact design (Gules are bar Or) nor the unexpected spelling "Spqb" are known, though this flag shares many features with all above versions and variations - letters on red and gold. National Geographic 1917 describes the lettering as standing for Senatus Populusque Romanus which they translate as "the Roman Senate and People." The National Geographic illustration (p. 370, no. 1048) differs from this illustration and the Hakluyt Society edition (plate 6, no. 24) in that it shows the lettering "Spqp" and not "Spqb". "Spqp" would be accepatble if the last letter is taken as glyphic alternative for "r", which is not far fetched for the 14th century. Addition No. 128 - Rome.